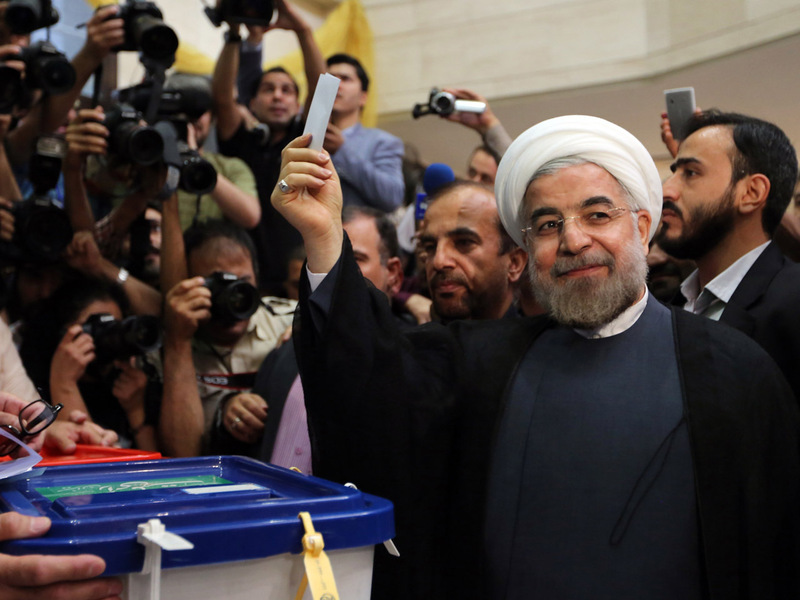 TEHRAN, Iran In the end, Iran's presidential election may be defined by who doesn't vote. As polls opened early Friday, arguments over whether to boycott the balloting still boiled over at coffee shops, kitchen tables and on social media among many liberal-leaning Iranians. The choice -- once easy for many who turned their back in anger after years of crackdowns -- has been suddenly complicated by an unexpected chance to perhaps wage a bit of payback against Iran's rulers. The rising fortunes of the lone relative moderate remaining in the race, former nuclear negotiator Hasan Rowhani, has brought something of a zig-or-zag dilemma for many Iranians who faced down security forces four years ago: Stay away from the polls in a silent protest or jump back into the mix in a system they claim has been disgraced by vote rigging. Which way the scales tip could set the direction of the election and the fate for Rowhani, a cleric who is many degrees of mildness removed from being an opposition leader. But he is still the only fallback option for moderates in an election that once seemed preordained for a pro-establishment loyalist. "There is a lot of interesting psychology going on. What is right? Which way to go?" said Salman Shaikh, director of The Brookings Doha Center in Qatar. "This is what it means to be a reformist in Iran these days." It's also partly a political stock-taking that ties together nearly all the significant themes of the election: the powers of the ruling clerics to limit the choices, the anger over years of pressures to muzzle dissent, and the unwavering claims that the last election was stolen in favor of Mahmoud Ahmadinejad, who cannot run for a third consecutive term. Iran's presidency is a big prize, but not a crown jewel. The president does not set major policies or have the powers to make important social or political openings. That rests with the ruling theocracy and its protectors, led by the immensely powerful Revolutionary Guard. But for liberal-leaning Iranians, upsetting the leadership's apparent plans by electing Rowhani could open more room for reformist voices and mark a rare bit of table-turning after years of punishing reprisals for the 2009 protests, the worst domestic unrest in Iran since the 1979 Islamic Revolution. "Rowhani raises a lot of interesting questions," said Scott Lucas, an Iranian affairs expert at Britain's Birmingham University. "Among them, of course, is whether he gets Iranians who have rejected the system to then validate the system by voting again." And there are many other factors at play. Many Iranians say they are putting ideology aside and want someone who can stabilize the sanctions-battered economy -- one of the roles that does fall within the presidential portfolio. This could boost candidates such as Tehran Mayor Mohammad Bagher Qalibaf, who is seen as a fiscal steady hand. Also, the rest of the candidates approved to run by election overseers -- from more than 680 hopefuls -- are stacked heavily with pro-establishment figures such as hard-liner Saeed Jalili, the current nuclear negotiator. Among those blocked from the ballot was former President Akbar Hashemi Rafsanjani, one of the patriarchs of the Islamic Revolution. The vetting appeared aimed at bringing in a pliant and predictable president after disruptive internal feuds with Ahmadinejad, who upended Iran's political order by trying to challenge the authority of Supreme Leader Ayatollah Ali Khamenei. The desire for calm is also fueled by the critical months ahead, which could see the resumption of nuclear talks with the U.S. and other world powers. But the presumed plans have met an obstacle in the form of Rowhani, who is a close ally of Rafsanjani and is now backed by other reformist leaders who had previously seemed resigned to defeat. In the span of 24 hours earlier this week, Rowhani received a major bump when a moderate rival withdrew to consolidate the support. Endorsements from artists, activists and others poured in. At the final rallies, Rowhani's supporters waved his campaign's signature color purple -- a clear nod to the now-crushed Green Movement and its leader, Mir Hossein Mousavi, who has been under house arrest for more than two years. On Wednesday, the last day of campaigning, thousands of supporters welcomed Rowhani in the northeastern city of Mashhad, yelling, "Long live reforms." Some Rowhani backers also have used the campaign events to chant for the release of Mousavi and other political prisoners, including former parliament speaker Mahdi Karroubi, which led to some arrests and scuffles with police. Rowhani is far from a radical outsider, though. He led the influential Supreme National Security Council and was given the highly sensitive nuclear envoy role in 2003, a year after Iran's 20-year-old atomic program was revealed. But he is believed to favor a less confrontational approach with the West, and would give a forum for now-sidelined officials such as Rafsanjani and former President Mohammad Khatami, whose reformist terms from 1997-2005 opened unprecedented social and political freedoms. Many are now a memory after clampdowns in the wake of massive protests claiming ballot fraud denied Mousavi victory in the 2009 election. There are no credible voter polls in Iran, and supporters of each candidate claim their camp is leading. Yet Rowhani seems to be tapping into growing energy and could force a two-way runoff next week with one of the presumed front-runners: Jalili and Qalibaf, a former Revolutionary Guard commander. Any significant boycott would likely hurt Rowhani the most. And a change of heart to vote by many liberal-leaning Iranians could push Rowhani toward the top. The worries appeared reflected Thursday in reported comments by Rafsanjani opposing the boycott. "I urge them to vote," he was quoted as saying by several pro-reform newspapers. Rowhani's backers, meanwhile, have adopted a motto of "one for 100" -- meaning every reformist should try to encourage 100 people to the polls. It's not hard, though, to find Iranians promising to snub the election. On some Tehran streets, about every third person planned to stay away. "Why should I vote?" asked Masoud Abdoli, a 39-year old paramedic. "They have kept opposition leaders under house arrest. They barred Rafsanjani." Samaneh Gholinejad, a psychology student, said she abandoned politics after the 2009 chaos. "Honesty left the country then," she said. On social media sites, Iranians have sparred round-the-clock over the boycott. Supporters often quote Albert Einstein's definition of "insanity" to describe the futility of voting after the allegations of fraud in 2009: "Doing the same thing over and over again and expecting different results." Responses on the other side note that great discoveries would never have occurred if people gave up. While there are no current signs of street protests resuming, security forces are on high alert. The Revolutionary Guard's volunteer paramilitary force, the Basij, is present in virtually every neighborhood. Authorities have steadily boosted controls on the Internet, attempting recently to close off proxy servers used to bypass Iranian firewalls. Last month, the U.S. eased restrictions on export of communications equipment to Iranian civilians in an attempt to counter the cyber-crackdowns. There is no evidence, however, of any major U.S. shipments opening new channels for Iranian Internet activists. In California, meanwhile, Google said it stopped a series of attempts to hack the accounts of tens of thousands of Iranian users with a technique known as phishing. "The timing and targeting of the campaigns suggest that the attacks are politically motivated," said Eric Grosse, Google's vice president for security engineering, wrote on the company's blog Wednesday. He gave no other details. Iranians traditionally have shown high interest in voting. The average reported turnout in the past 10 presidential election is more than 67 percent, with officials saying there was 85 percent participation in 2009. There are no independent election observers allowed to verify the numbers, but no major allegations of vote rigging emerged until 2009. Khamenei has repeatedly called for a high turnout as a reply to Western governments that have strongly questioned the openness of Iran's elections -- including the process of vetting candidates. Shortly after he cast his vote Friday morning, Khamenei had sharp words for overseas critics. "Recently, I have heard that a U.S. security official has said they do not accept this election. OK, the hell with you," he said in remarks broadcast by Iran's state television. Khamenei said if Iran was supposed to wait for U.S. approval, there would be controversy. In Washington on Thursday, State Department spokeswoman Jen Psaki said that while the U.S. does not think the Iranian election process is transparent, it is not discouraging the Iranian people from voting. "We certainly encourage them to," Psaki said. "But certainly the history here and what happened just four years ago gives all of us pause." A prominent political Twitter activist, who goes by the handle Koroush, showed the inner conflicts of many Iranians. He posted a message Thursday saying he will stay home but prays he will regret it. "I will not vote," he wrote. "But I hope I will be regretful if others vote and Rowhani wins."